People who live in Glass Houses...should pay their bills! What sticks in my craw (Grandpa's phrase) is how they had put the paying of ills to the vendors on the back burner... meanwhile the cogs of the Chrystal machine just kept turning, keeping the status quo, for the most part. "What we're doing now is we're trying to WALK WHAT WE PREACH"
....Hmmm.... Was it the lawsuits against them that lit a fire under that "walk?" 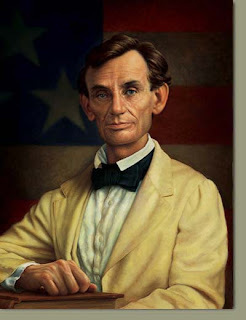 Abraham Lincoln, well known non-member of any church, was left high and dry by William F. Berry, his former partner in a store they co-owned in 1832 in New Salem, Ill. Berry loved his whiskey, and after signing his name (and Lincoln's) to a tavern license, they were able to sell liquor. Lincoln did not drink. Berry was his own best customer, and nine months later Abe sold his interest in the store to Berry. When Berry died in 1835, he left considerable debt, and because Abe and Berry were partners, Abe became responsible for Berry's debts as well. $1,100 was a large sum in 1835, equivalent to $25,000. in today's dollars. It was very common in the early 1800's for debtors to skip out on their debts, escaping their creditors in the middle of the night. But Lincoln stayed, telling every single creditor that they would be paid, and with interest. This man stayed who had read Thomas Paine's "The Age of Reason ," who was looked down upon by the Religious in Springfield...refusing to vote for him, because he was thought to be a heathen. He eventually paid back every penny, thus earning him the nickname "Honest Abe". I would say that Abe walked that walk, never preaching to anyone on how they should live....but instead served us with an example of how HE lived. ExChristian.Net: People who live in Glass Houses...should pay their bills!